I can’t even begin to tell you why this story is so amazing! First, you’re going to enjoy the characters because Andrew Clements is an amazing writer and does an outstanding job describing them and their actions. Nick is hilarious and you’ll laugh at all the troublemaking he does in class. It was also interesting to read about a battle between a student and a teacher. Lastly, the problem is so interesting that you’re won’t be able to put the book down until you know how it ends. I recommend this book for kids in grades three through six, who love hilarious, school stories. It’s also a great story that teaches students to never give up and to believe in yourself. 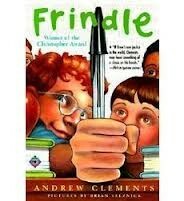 So go ahead and read this book to find out who will win the “Frindle” battle.